Mrs. Hester's Classroom : Glossary: FREEBIE!! Multiple people have asked for it, either through email or comments, so here it is! The blank template in here. My Algebra 1 completely filled version is here. The font is Berlin Sans FB Demi and comes standard on most computers. Please share on Pinterest and follow using Bloglovin to show your support! This is awesome! I could only download a PDF version though. Oh no!! Did you download on a device with Microsoft Word installed? If not, it may have defaulted to pdf version. I’ve talked to a few others that have downloaded the word version fine. Maybe try again on a computer that you know has word. If it still won’t work send me an email and I’ll send you the files! I'm glad you enjoyed it!! Thanks for stopping by and leaving a comment! Thank you for sharing your hard work! Going to try interactive notebooks this year with my 6th graders. This is great - thanks so much for sharing :) Did you use a textbook to get your algebra definitions? Wow. Love it! Just one thing: how many pages are need to accommodate the glossary? Thank you! Thank you so much for the glossary! I am revamping my INBs for this year and your blog is very helpful! This glossary is great! This is my first year doing IAN and I love it, but having trouble with the kids using it. I think that the tabs will help. Is there another way to access the glossary? It says that the link is no longer active. Thank you for your generosity! Hi! Can you repost our blank template? I teach 6th grade Science and would love to get started on our science terms over the summer! 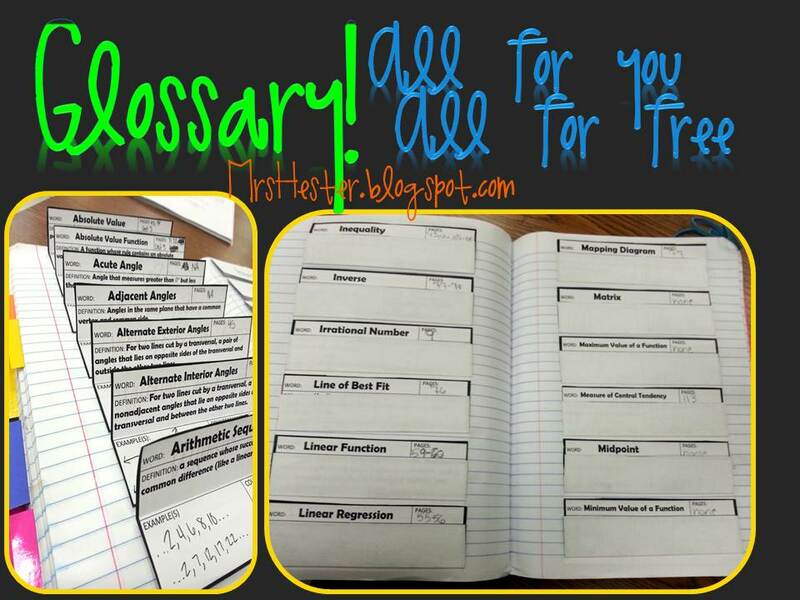 I love the idea of a glossary and am starting organized INBs this year. I've attempted to click on both links and neither of them work. Can you please update the link or let me know where I can access this freebie! Thank you in advance!!!!! You still have the link with editable template? Would love your modified Frayer model! Link above no longer works. Hello, Is the link still available?